This month is all about Love! Use these activities to help kids complete service acts for others. The ideas outlined in this post can inspire random acts of service and kindness for kids. We are so excited to join the All Things Kids bloggers in the series for this month. We are each sharing activities based on the book The 5 Love Languages: The Secret to Love That Lasts by Gary Chapman. 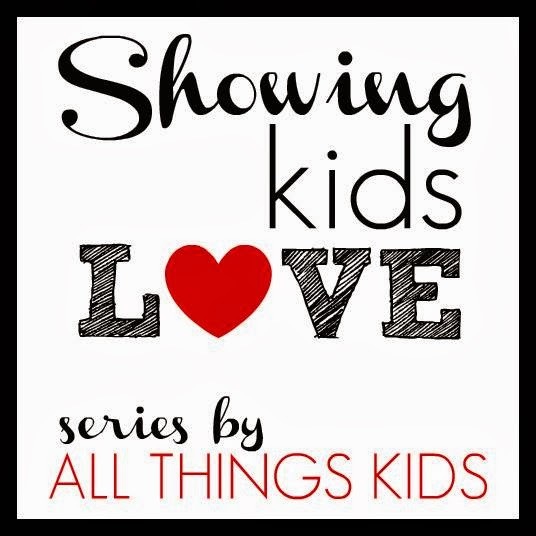 Our post today explores ways for children to show and receive love in Acts of Service. 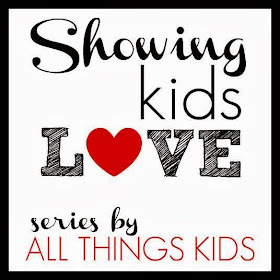 Read more about this Showing Kids Love Series at All Done Monkey. Acts of Service are evidence of love shown by servicing others. You know the saying, "actions speak louder than words"? We show our loved ones love by doing things for them; ...Washing the dishes, preparing them meals, finding that missing Teddy Bear at 2 am are ways we show our families love through service. We came up with ways for children to show their love for friends, family, and random strangers through acts of acts of service and kindness. When a random act of kindness is bestowed, it grows love forward! Not only does the giver feel generous, giving, and significant...but the recipient of that random act of kindness feels special, cherished, and loved. To keep track of our kindness acts, we created this kindness banner. That way, we could decide on what task to do next. This was such a fun project to do, each step of the way! 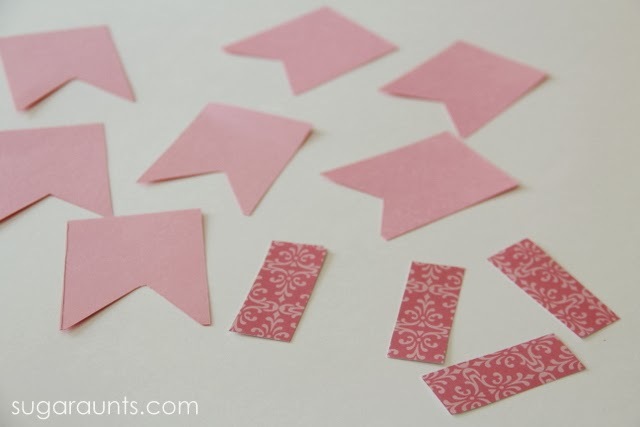 I cut small banners from cardstock and glued on a patterned top for a touch of color. 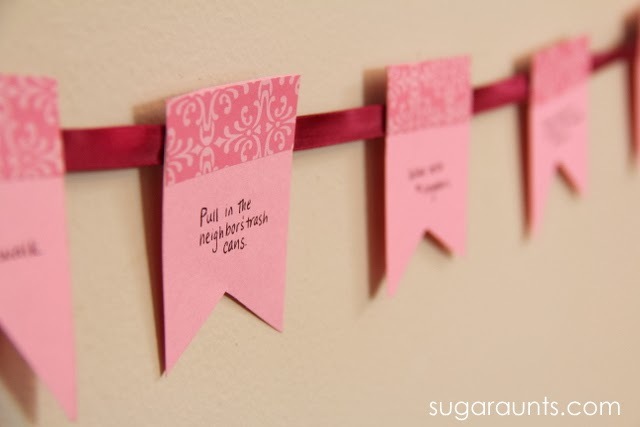 These were taped to a long strand of ribbon and strung on our wall. We put it up at child-height so the kids could see the words of giving on each banner, and mark off the acts of kindness as they were completed. The kids loved hearing all of the kind acts and deciding who should receive our acts of service. After a task was completed, we stuck a foam heart sticker on the banner. 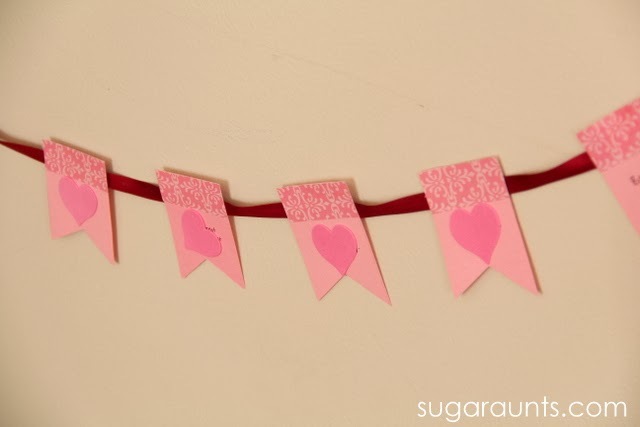 Our finished banner looked so pretty and makes a great Valentine's decoration! 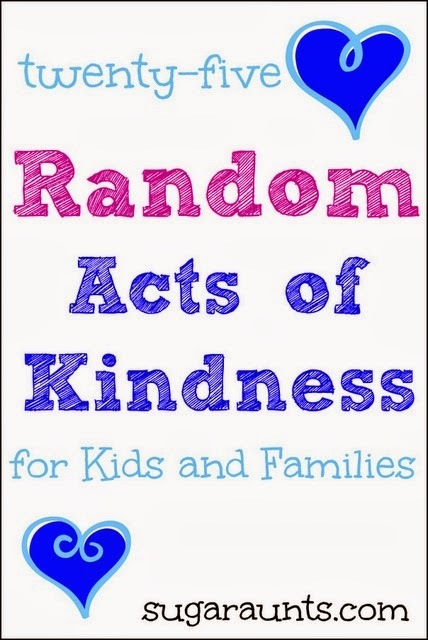 So what are some service activities that would be great for Random Acts of Kindness for Kids? 1. Collect canned goods for the food bank. 2. Pick up trash in the neighborhood. 3. Invite a new friend over for a play date. 4. Send thank you notes to the fire department and police station. 5. Hold the door for someone. 6. Bring in a neighbor's trash cans. 7. Write kind notes for siblings. 8. Put out birdseed for the birds. 9. Bake cookies for a neighbor. 10. Smile and say "Hello!" 11. Deliver flowers to a neighbor you don't know that well. 13. Give outgrown clothing to a smaller friend. 14. Donate books to the library. 15. Wave hello to a neighbor. 16. Shovel snow from a neighbor's walkway. 17. Bring a treat to school for your teacher. 18. Draw a picture for the mailman. 19. Help prepare and deliver a meal for a family with a new baby. 20. Tell the trash collector "Thank You!" 21. Write a note to Grandparents saying why they are special. 22. 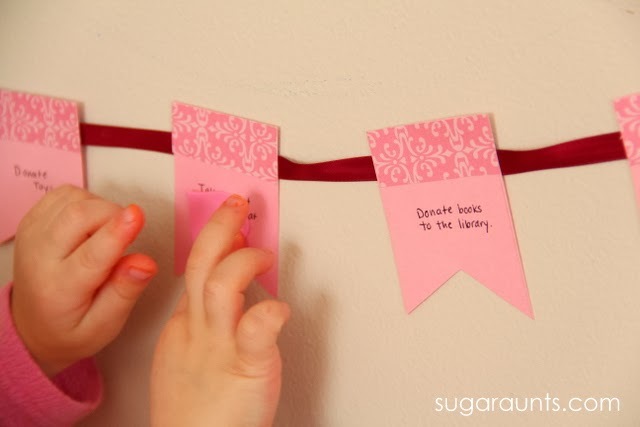 Give neighbors some candy chocolate "hugs" and a note saying "hugs from your neighbor!" 23. Draw a picture for your librarian with a note saying "Thank YOU!" 24. Bring bubbles to the park and some extras to share with other kids. 25. Write encouraging messages in chalk on the sidewalk to brighten someone's day. 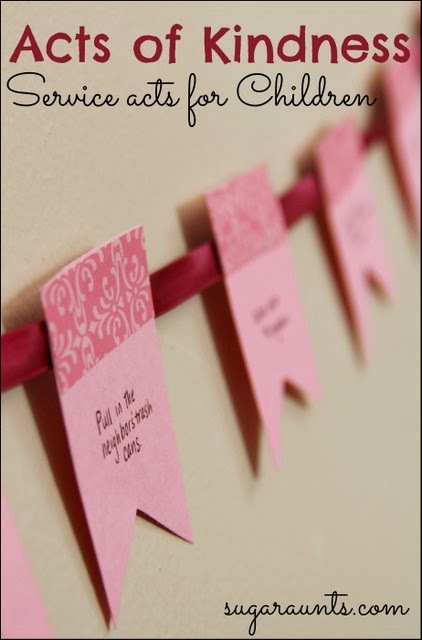 Have you done any random acts of kindness or acts of service with your children? What kind of activities have you done? Do you have a blog post to share that focuses on love, kindness, an activity you and your child completed together where love was apparent?? Link it up below. We would love to see it! You can read more about the 5 Love Languages and the activities to go along with them by visiting Crayon Box Chronicles, All Done Monkey, House of Burke, Mamas Like Me, and Frogs and Snails and Puppy Dog Tails!